Published 2002. 59 pages, A5, illustrated. 8 chapters. Unless otherwise indicated the illustrations are from the extensive Roger Packham collection. The Caterham valley and the Smitham Bottom valley were in the past reputed to be deserted and unhealthy, only the haunt of gypsies and highwaymen. However, the Romans saw fit to build a road over Riddlesdown, through the valley which is now Whyteleafe and over Timber Hill, Caterham and on to the hills north of Brighton and other travellers found their way along what is now Brighton Road from Foxley Hatch (Purley) to The Red Lion, Smitham Bottom – on record as long ago as the 17th century – and probably long before that. A racetrack beside Brighton Road is also shown on early maps. Waters rose unpredictably and the valleys were flooded every few years and the Bourne, or ‘woe waters’ as it was often called, gained a reputation far, far beyond its surrounding hills for portending national disasters. Almost certainly the gathering of the flood waters amongst low-lying communities in Croydon was a time of woe and disease for them. In the 21st century, with development continuing to spread over the hills south of Croydon and drains and culverts controlling most of deluges that occur, the rising of the Bourne seems – and only seems – to be less frequent. The water that once soaked through the chalk and built up to emerge traditionally every seven years, now flows along much of its way north to the Wandle at Croydon and on to the Thames at Wandsworth less visibly through artificial channels. The Bourne Society chose that name in 1956 as most members came from the parishes that abut onto the Caterham and Coulsdon Bourne valleys. 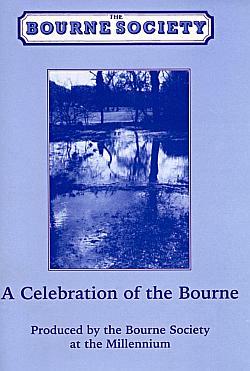 James Batley wrote about the Bourne in the first article of the first annual Local History Records in 1962 and other authors have since added to the story. In this Millennium year, we present a compilation of the facts in words and pictures.